Can Mizoram’s Unique Campaigning Model Be Replicated Elsewhere? AIZAWL: The fervour of two events driving the country crazy — Sachin Tendulkar's swansong Tests and the upcoming assembly elections — is missing almost entirely in Mizoram. Being in a football-crazy state, it is understandable that most television sets are tuned in to mundane Hindi soaps, films dubbed in the local language and western music videos even as the Maestro turns out at Kolkata's Eden Garden. But the absence of any din related to polls — barely a fortnight away, is conspicuous, more so for a state that recorded an impressive 82% voter turnout in 2008. There are no posters to be seen anywhere in the city, while the handful of banners are within the size stipulated by a local NGO. Candidates are barred from distributing footballs and party workers are not allowed to wear caps, T-shirts or badges with the election symbol printed on them. 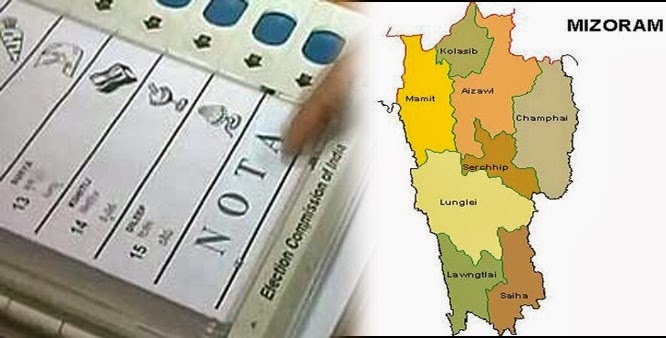 Though political analyst Vanlalruate expects the chatter to get louder as campaigning - heavily monitored by the Church and its vigilante groups like Mizoram People's Forum (MPF) — picks up after Monday's deadline for withdrawal of nominations, he is sure that it would never reach the fever pitch associated with elections elsewhere in the country. "Mizoram has always been an unusually quiet place - even in the capital city of Aizawl you barely ever get to hear any honking," he says. "Though things will pick up with Rahul and Sonia Gandhi visiting the state next week, it will never become even a fraction of the circus that it does elsewhere." Among the MPF's diktats - prohibiting door-to-door campaigns, feasts, separate rallies and slandering rivals — that make electioneering a colourless and low-key, if utopian, affair, the one that has riled youngsters most is the ban on musical road shows. "This is beyond the polling norms issued by the EC and it does no good for anybody. Not only does it stop musicians from earning their livelihood during this festival of democracy, it also takes away the one thing that attracts Mizo youth to politics," says Lalfengmawia, a senior functionary of the MZI, a federation of musicians and singers. "Even in the US, reputed bands like U2 and Pink Floyd perform for Republicans and Democrats and nobody makes a big deal about it." Emanuel Lalhriazual Ralte, a 31-year-old entrepreneur, agrees: "Narendra Modi may be dividing opinions across the country, but he does not have much traction in Mizoram, and Rahul is known more as the son of Rajiv Gandhi, who is held in high regard by locals for the 1986 peace accord, ending years of brutal insurgency. I can assure you, more Mizos would turn up for music concerts than for rallies by either of the two." Some believe that the campaigning structure in Mizoram is a model that could be replicated elsewhere in the country. Hoping that the turnout beats Tripura's record of 90%, chief electoral officer Ashwani Kumar says: "Campaigning in Mizoram works very differently. There are a very few violations of the code of conduct — candidates here actually call us to inform us about their canvassing plans and ensure that their strategy does not flout EC guidelines." Lalthlamuana Ralte, an assistant professor at Aizawl's Pachhunga University College, says: "I am in favour of third-party controlled campaigning as it ends bribing for votes and provides a level playing field, but I do not believe it will work in other parts of the country. Religious organizations interfering with politics will not be taken kindly in other places."